Precast concrete manholes have become the construction industry’s product of choice over cast-in-place concrete, brick and other non-concrete products for many reasons, not the least of which is ease of installation. 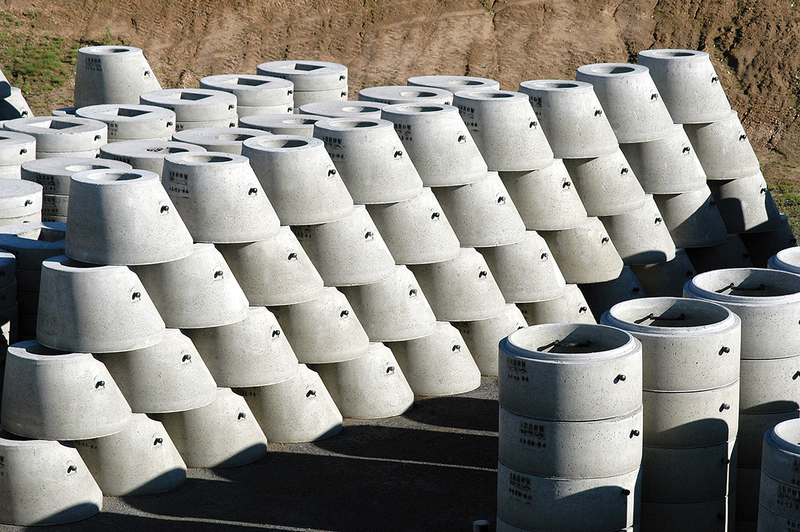 Precast concrete manholes can be easily installed on demand and immediately backfilled. There is no need to wait for concrete or mortar to cure at the job site. The degree of soil compaction around the manhole and remaining trenches is never a problem, making installation faster and easier. Contractors are familiar with how to handle precast concrete manholes and can easily install them. Standard sealants and flexible joints are readily available and are vital to water tightness. Because precast concrete products typically are made in a controlled environment, they exhibit high quality and uniformity. Variables affecting quality typically found on a job site – temperature, curing conditions, material quality and craftsmanship – are nearly eliminated in a precast plant. Precast concrete strengthens with time, while other materials can deteriorate, experience creep and stress relaxation lose strength and/or deflect as they age. The load-carrying capacity of precast concrete is derived from its own structural qualities and does not rely on the strength or quality of the surrounding backfill materials. Studies have shown that precast concrete products can provide a service life in excess of 100 years. For severe service conditions, additional design options are available that can extend the life of the precast concrete product. This is extremely important when calculating life-cycle costs for a project.